The first TV anime series to air this summer season will be Kingdom. It is a historical anime with a lot of action. The story comes from Yasuhisa Hara’s original manga, which is not only the most famous by the author, but also the only one. 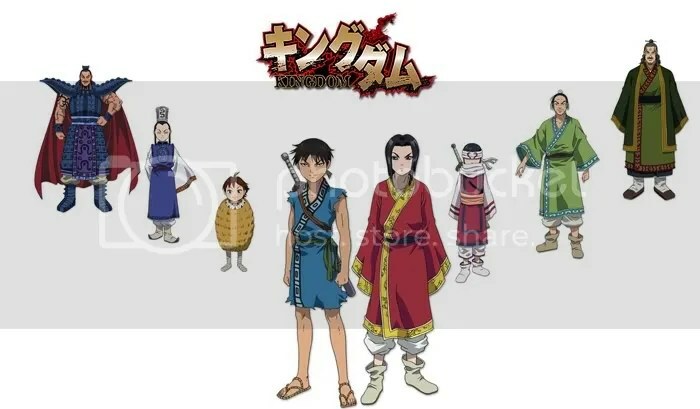 Kingdom will begin on June 4, 2012 and will definitely be a nice and diverse opening of the television anime summer season 2012. Naturally, I am here to guide you through the show with all my might (and all the information available). The story revolves around our main character Ri Shin and begins with his friend Hyou. Both of them are two orphans living during the war and not just any war – the Warring States Period of China (between 475 and 221 BCE). The two of them are citizens of the Kingdom of Qin, but even as young boy know that in order to be great, they need to prove their value at the battlefield. Still at a young age, though, Hyou is taken by a stranger to the palace and when he returns, he is no longer the same boy that Shin used to know. Years go by and Ri Shin is starting to become stronger with each day. At a certain point in time, he meets another boy that resembles Hyou in his eyes – Ei Sei, the current King of Qin and the future Emperor Shi Huangdi. We follow Ri Shin’s life as he struggles as a lonely, orphaned child in during hardships and as he fights for his right to become a great warrior. The original story comes from Yasuhisa Hara’s only manga series going to by the same name. The manga has been in publishing since January 26, 2006 in Young Jump magazine. It is an ongoing manga and, if this project turns out to be liked, maybe we will see the birth of a longer anime series, though currently there are not many chapters out. Ki Ou is the military commander, a living legend from the past. One of the so-called ‘big six’ who were able to stop any attack and crush the enemy. His blood is boiling and always looking for a battlefield to fight on. Kyou Sei is Sei’s half-brother. He is angry at the family and the government for making Ei the King and future Emperor and plans a way to make everyone pay for this situation. Ten Karyou (Ten) a descendant of the mountain people. He is a smart boy with various interests and abilities one of which is cooking! Shin is a phenomenon when it comes to sword fighting. He was able to wield the weapon since a very young age and is aiming into becoming a legendary warrior. Ei Sei at the fragile age of just 13 he is named the Ruler of the Qin and a future Emperor. He has a will to unify all of China, but does he have the power to achieve it? Kai Kyou a member of a famous ninja-like clan that is exceptional in combat and with the notorious Dance of Death. Heki a noble and sincere subordinate of the King and a trustworthy man. He is happy with his position and ready to help the one in charge if needed. Shoubun-kun/Kun Fun Shou is loyal to the civilian government and has shattered many enemies during his time as a warrior. He has a rich military experience, which is valued even by the current king. I am expecting this to be a fun and very active show with some historical basis, but not too much. I am personally surprised by the huge amount of traps (since I was pretty mistaken about most of the character’s genres. You humans leave me nothing to be certain of! ), but I believe it would not necessarily do damage to the show’s quality if it’s well made. The manga is a seinen one and I expect this to be kept in the anime too, though, judging by the character design, it seems like I’m up for a shounen. best anime since a long time !!! Kingdom season two is coming out in June this year, but the exact air date is not announced yet. This anime is amazing one….every anime lover’s love this anime for sure…I watched number of anime this is one of the best….expecting lots of new things in season 2 ….. I will try to get some news about whatever is up soon from the franchise, Rozen-chan! definitely the best action anime series so far, and its sad it ended but looking forward to season 2. Nothing new has been updated, but I asked some questions and will hopefully get a response! I am feeling a bit taken aback from the animation. But it’s just one pilot, so it may get better. Wonder how does the Dance of Death look, having in mind how Kai Kyou looks like a 5 year-old. I am so hoping for a good shounen anime… Reading the manga, though and there are not so many chapters published… We’ll see.